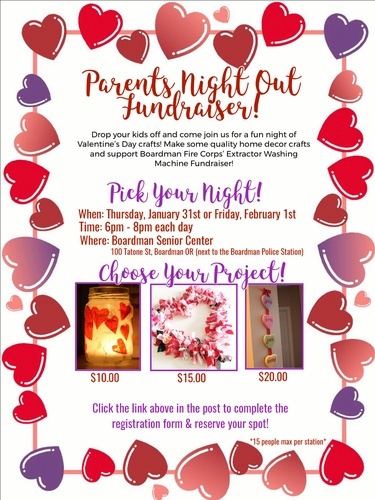 Join Boardman Fire Corps Thursday, January 31st and Friday, February 1st from 6:00-8:00pm for a fun night of Valentine’s Day home crafts JUST FOR ADULTS! Boardman Fire Corps will be hosting their first Craft Night Fundraiser at the Boardman Senior Center! Learn how to make easy but cute home decor crafts, chat with adults about grown-up things and sneak away from the kids for a few hours! All while helping Boardman Fire Corps continue to raise funds for an Extractor Washing Machine for the Boardman Rural Fire Protection District.